Divya Mukta Vati is mainly indicated for hypertension (high blood pressure). It is an Ayurvedic proprietary or patent medicine manufactured by Swami Ramdev Maharaj’s company Divya Pharmacy, Haridwar (also branded as Patanjali). In this article you will find in details about ingredients, how to use, dosage and side effects of Divya Mukta Vati. In my clinical practice, I found it as one of the best Ayurvedic medicine for high blood pressure (high BP or hypertension). If someone’s blood pressure is 120/80, 120 denotes systolic pressure and 80 denotes diastolic pressure. 120/80 is the normal range of blood pressure. Now coming to the details about the medicine Divya Mukta Vati. Divya Mukta Vati contains many herbs and other natural ingredients which have other beneficial effects on brain and may be used in other problems like depression, anxiety, sleeplessness (insomnia), mental agitation, hallucinations etc. But my personal experience says that it should be used in high BP or only in conditions associated with high BP. 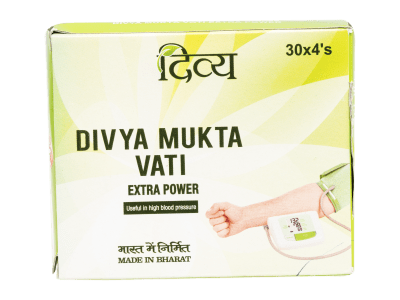 As the intake of Divya Mukta Vati cause a downfall in blood pressure, so if used in a case where blood pressure is normal, it may cause any bad effect. This medicine is also found to be very effective in high blood pressure caused by renal failure or other kidney diseases. It is safe to use for the long term under Ayurvedic doctor’s supervision. A diabetic patient can also use Divya Mukta Vati if having high BP problem. Divya Mukta Vati is good for sleep. So if you are suffering from high BP problem along with sleeplessness (insomnia), anxiety, depression, palpitation etc. this medicine is safe and highly recommended for you. 1 to 2 tablets twice or three times a day before breakfast or meal (best if taken with cow’s milk, not water). Minimum 30 min of a gap should be maintained before taking any meal. Divya Mukta Vati is highly potent and a fast-acting Ayurvedic medicine for high blood pressure. I have seen its effect within 1 hour of intake in most of the patients. The dosage of Divya Mukta Vati is variable depending on the value of blood pressure. If you are taking other allopathic medicine for BP management, you should not stop that medicine immediately. The dose of anti-hypertensive medicine will be gradually reduced by Ayurveda doctor according to the effects of Divya Mukta Vati and your body response. One may follow below chart for dosage information. (* Divya Mukta Vati should be used only under Ayurveda doctor’s supervision). Manufacturer of Divya Mukta Vati claims that it has no side effects. It is well tolerated by many of the patients. But some of my patients reported nasal congestion, drowsiness, dryness of mouth and breathing problem due to congestion. Side effects are reduced by taking Divya Mukta Vati with cow’s milk. But if the problem persists, it is better to discontinue its intake. What can I use as an alternate of Divya Mukta Vati if it doesn’t suit me? Those who are getting some sort of discomfort or any side effect by Divya Mukta Vati can use Ayurvite’s Cardo Capsule and Shayanam Capsule, 1 capsule from each twice a day or as directed by the physician.